duced the perfectly straight unbroken front, as Heppelwhite frequently did. In the second place, Sheraton made the corners of his sideboards convex; while Heppelwhite, almost invariably, introduced the concave corner to his designs. By that means, the former considerably enhanced the drawer-space by the difference between the two curves—the concave and the convex. This, as I have said, may be accepted as a practically invariable rule, to which there are few, if any, exceptions. 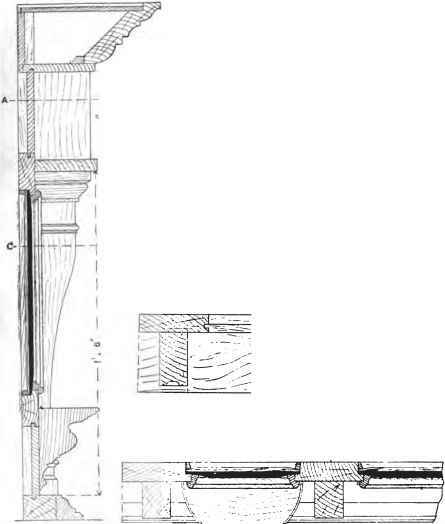 As will be seen, too, on Plate IV., Sheraton was hardly pleased with the somewhat bare appearance of the sideboard top, pure and simple, without anything to give a finish to it and lead up to the wall above ; he formed the idea, therefore, of adding a superstructure of brass, in many cases somewhat elaborate, from which silk or other curtains could be suspended. This plan was seldom, if ever, adopted by Heppelwhite, who, in the treatment of this piece of furniture, cultivated greater simplicity in every respect, and did not by any means exhibit ingenuity equal to that of Sheraton, a quality which I may state without fear of contradiction he did not possess in any very great degree. As to the form of the superstructure referred to, Fig. 8, Plate IV., furnishes one example of a type which, says Sheraton, " is used to set large dishes against, and to support a couple of candle or lamp branches in the middle, which, when lighted, give a very brilliant effect to the silver ware. The branches are each of them fixed in one socket, which slides up and down on the same rod to any height, and fixed anywhere by turning a screw. These rods have sometimes returns " (additional rods running at right angles to the back ones) "at each end of the sideboard" (see Fig. 10), "and sometimes they are made straight the whole length of the sideboard " (see Fig. 8), " and have a narrow shelf in the middle " (see Fig. 10 again) " made of fine half-inch mahogany, for the purpose of setting smaller dishes on, and sometimes smaller silver ware."